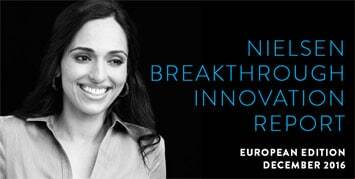 Nielsen has selected 11 European Breakthrough Innovation winners for its annual report of the same name. The report on FMCG products explores “how our winners have leveraged package design, pricing, in-store execution and advertising to truly remarkable effect”. This year’s winners, seven of which are food-bev items, were chosen from among 9,900 new initiatives in Europe, and hail from France, Germany, Italy, Russia, Turkey and the UK. The objective of this report, writes Nielsen’s analysts, is to celebrate these winners and, at the same time, to learn from them. “We know that identifying the right ‘job to be done’ — the key consumer struggle that an innovation will resolve — is the basis for building strong consumer demand, while perfecting the product experience is essential for sustaining and growing this demand. “However, developing a product that consumers will love is only half the journey. The other half is launching with excellence so that the innovation has the chance to realise its potential. The 2016 edition of the report focuses on how to maximise the potential of these innovations in market. It explores how the winners have leveraged package design, pricing, in-store execution and advertising “to truly remarkable effect”. The full report can be downloaded here, FREE (53 pages).